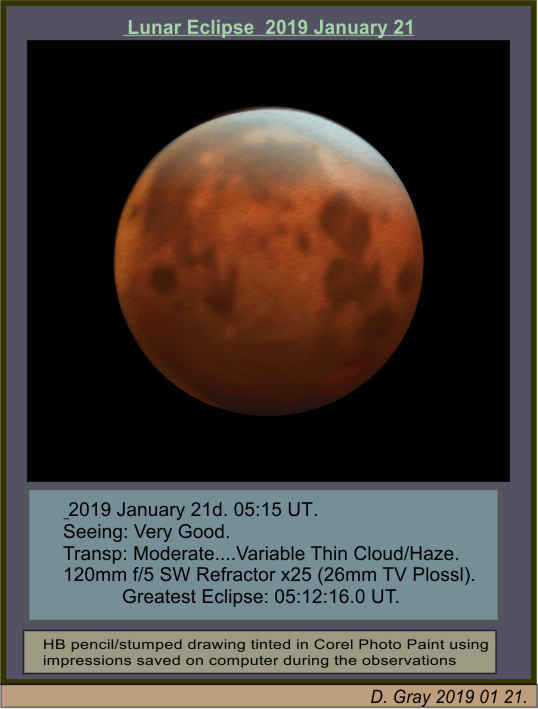 Hues of the Lunar Eclipse 2019 Jan 21. What is presented here is the best one of them with the shadings etc. modified (stumped over) to match the eclipse levels in the 120mm scope. A pair of 3x40 (19th century) opera glasses piggy- backed on the D-K mount being used for the basic pencil sketches. This was sheer luxury and leisurely: like tackling a planet in perfect seeing with the big scope........! I have a large number of subtle hues (greens/lilacs etc. etc.) recorded as they developed/presented during the event: I hope to turn these into a progressive series for posting later (when more time!). Back in 1964 Dec 19 was a similar eclipse when the Moon crossed the northern part of the umbra and was presumably catching more strongly refracted sunlight giving it a very Mars-like NP Hood effect as many reported. This time also but not so pronounced as I recall that in 1964 – perhaps suggesting the Earth’s atmosphere was particularly clearer on that occasion. The Moon being about 1’ deeper in the umbra this time seems not enough to make that much difference in lighting I feel. Edited by David Gray, 22 January 2019 - 05:25 AM. Very good sketch of Hues of the Lunar Eclipse 2019 Jan 21. . I, too, was clouded out at Total Time. And I found it hard enough getting up at half past four! I drew the 2010 December eclipse from scratch from the comfort of the back bedroom window, it's a real undertaking! Many Thanks wargrafix, deepwoods1, Tom, Jef, Chris and those who Liked………..
Chris: guess I was burning the candle both ends………I did originaly plan for 3:30 a.m. had I got those basic sketches I was denied by too much cloud. Went to bed just after 9 p.m. but waking around 1 a.m. and seeing the carpet bathed in moonlight got the adrenalin going so up I got…. There was a 22º halo round the Moon at first but the haziness thinned a good deal for a while so got going with those sketches and was soon on a buzz! Anyway got to bed after teatime yesterday and slept best part of 14 hours; which is about the total of the previous 3 nights! Many comments about the similarity to Mars. I guess before someone puts all of us right: for me the similarity is pretty superficial. I reckon what some of us are expressing is addressing our early notions of what we expected Mars to look like (colour-wise). That 1964 eclipse was more ‘Mars-like’ to me than this one; but I soon modified that view when I got my first good look at the planet in 1965 with the 10” Newt. Attached is about the best view of Mars I ever had (16.3” D-K): when seen like that those salmon desert tones I’ve never seen at any Lunar eclipse. Funnily enough when I said here that using the 3x40s “…….was sheer luxury and leisurely: like tackling a planet in perfect seeing with the big scope........!“ it was this particular view of Mars that I had in mind. In fact I was so involved getting those hues (PC – to-ing & fro-ing) that I failed to add the considerable amount of finer detail I could/should have rendered also……. Edited by David Gray, 22 January 2019 - 09:54 AM. 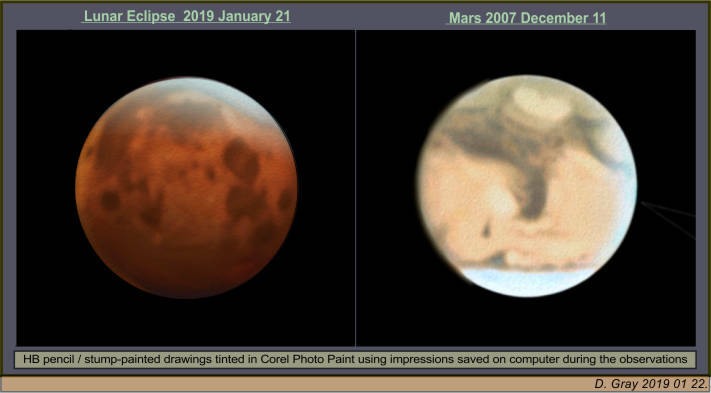 That is really an impressive Mars sketch from 2007. The colors and detail are exquisite. A memorable event – more so because the fairly clear sky endured; lost count of the number of these I’ve planned for and been denied by the wrong weather arriving…….no comment about forecasting………. Colours were particularly striking due to it being close to the north-edge of the umbra, and with some short-lived/transient subtle hues. Next one (Jul 16) is a deepish partial one that may well offer interesting tints. Will be low here but I have the ADC (Atmospheric Dispersion Corrector) now………. Frank: checking WinJUPOS Mars’ disk was 15.7” back then, and would be nice to get such conditions next apparition when its >20”. Nice soft tones in there Dave. Nice to see a realistic representation of the true tones rather than the all too often over saturerated refs and oranges in artwork and certainly imaging. Shaping up for another clear night - sidelined again mayhaps.........!